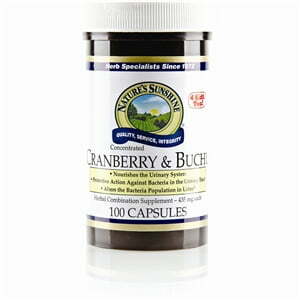 Nature’s Sunshine Cranberry & Buchu Concentrate combines the properties of these two plants to provide support for the urinary system. Cranberry juice helps rid the urinary tract lining of microbes that could prove harmful to the body. Buchu provides essential nutrients for the urinary system. Nature’s Sunshine Cranberry & Buchu Concentrate is carefully processed from a liquid to the concentrated powder enclosed in each capsule. NOTE: If you are currently taking uva ursi, do not take this concentrated formula. Instructions: Adults: Take one or two capsules with a meal three times daily. 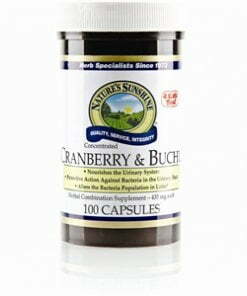 Drink one glass (8 ounces) of Nature's Spring water with the capsules. Use every day to help maintain a healthy urinary tract system. Children: Take one capsule with a meal twice daily.